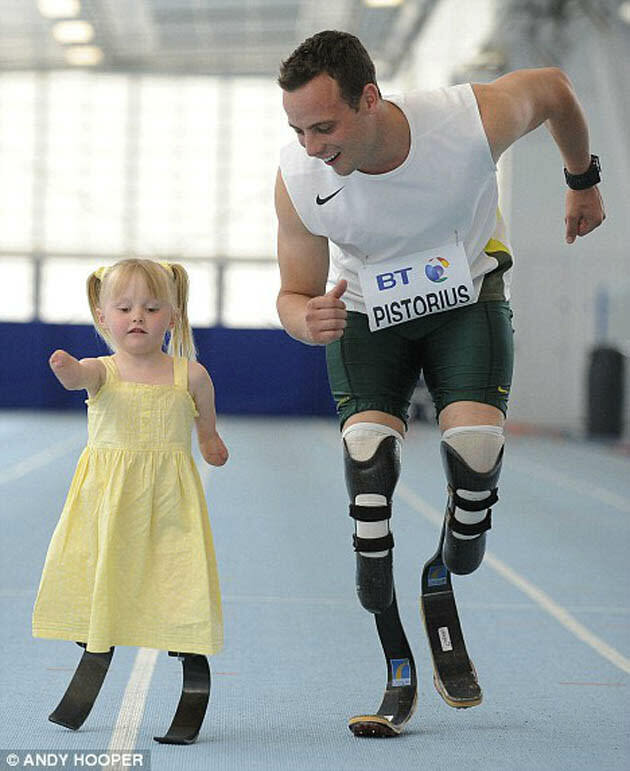 Oscar Pistorius has already inspired a generation with his 400m performance, despite being a double amputee. See? This is an older photo, but it surfaced Sunday on Twitter and was passed around the Web after Pistorius raced. It reminds viewers that what Pistorius did for other amputees is immeasurable. Around the world, there were people who are missing arms and legs who looked at him and thought, "If he can do it ..." Ellie Challs, the young girl he is racing here, saw a man who looked like her but didn't accept limits. But he also did plenty to inspire "able-bodied" people. Though he didn't make it to the final, he did run well enough in his first heat to make it to the semifinal. Kirani James, the man who won the semifinal Pistorius ran in, was so moved by him that he switched bib numbers with his opponent after their race, and held up Pistorius' bib to the crowd in London.